Abrasive Wheel Use, teaches the correct fitting, adjustment and safe use of Abrasive Wheels as well as the legal requirements. Course Aim - To enable operatives to use, identify the safe selection and mounting of abrasive wheels in accordance with the relevant regulations. Machines Covered - Bench Grinders, Angle Grinders, etc. 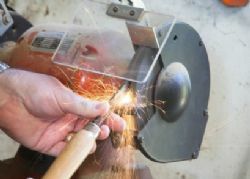 Suitable for - Persons who use portable grinding equipment as part of their daily duties . All candidates will be certificated through RDM Industrial Services Ltd.